The Democratic gubernatorial debates ended last night. Three decent, intelligent individuals with strong commitment to Massachusetts and public service. Notwithstanding Attorney General Martha Coakley’s double-digit advantage in the polls, it is Treasurer Steve Grossman who has emerged as the most solid choice. 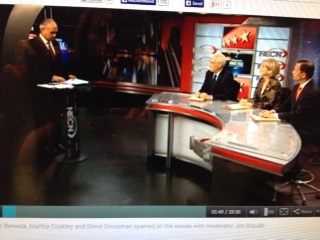 Coakley has the advantage of superior name recognition, while Grossman has drawn the major newspaper endorsements . He’s the one who can put it all together as gubernatorial material. Coakley, coming from the legalistic ways of the state’s chief prosecutor, tends to look at problems with a certain, if sometimes opaque, practicality but is distinctly without a vision, a leitmotif if you will. Berwick has lofty ideals but fails to detail how his self-touted management skills would implement his vision. Grossman manages to have generous helpings of both vision and practicality, and he has a track record both in the Treasurer’s office and in the private sector of delivering on his proposed innovations, especially when it comes to job creation, and combining efficiency with progressive values. His performance in recent debates has been strong, leaving viewers the impression he would be a strong candidate against likely Republican nominee Charlie Baker in the general election. Grossman is very well informed, thoughtful and straightforward in his approach to a whole range of challenges. Coakley is nuanced to a fault, and, while Berwick is clear cut about what he aspires to, he does not explain how he would get from point A to point B. He simply says that’s what leadership is all about. One of Berwick’s best lines was directed toward Coakley and her nuance. “All we’ve heard from you is boilerplate.” She has yet, he said, “to be bold on something controversial.” That approach could win her the nomination, but might be too cute by half for the general election. As Boston Globe columnist Shirley Leung wrote regarding Coakley on the casino issue, “Martha Coakley is bouncing around on the casino issue like a pair of dice on the craps table. Only by chance do you find out what she really thinks.” I would add that, in addition to Grossman’s ability to talk the talk and walk the walk, he would be a stronger candidate in November against Republican Charlie Baker. In fact, that match-up would be beneficial to the voters. This race has not generated much enthusiasm. Conventional wisdom has it that in a low-turnout race the candidates’ ground games, their ability to get their supporters to the polls next Tuesday, will matter. The polls usually sample likely voters, who may be as little as 20 percent of the electorate. So the only poll that matters is the vote on election day. And, trite though it sounds, every vote still does count. This entry was posted in Politics and tagged casino repeal, Charlie Baker, Democratic gubernatorial primary, Don Berwick, Martha Coakley, Shirley Leung, state primary, Steve Grossman. Bookmark the permalink.